Fran Jurga`s Hoof Blog: News from Hoofcare + Lameness: Hallmarq Standing MRI and Chronic Equine Foot Lameness: What’s Going On Inside the Foot? 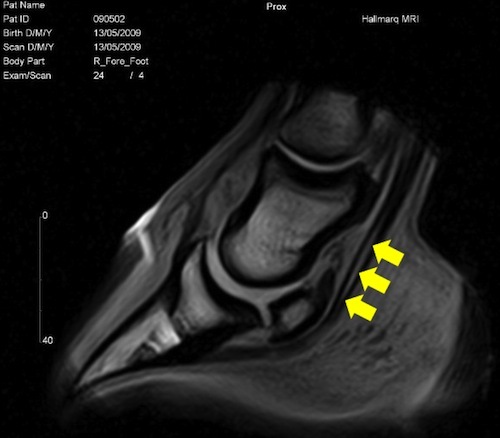 Hallmarq Standing MRI and Chronic Equine Foot Lameness: What’s Going On Inside the Foot? Sport horse lameness requires a diagnosis to pinpoint the injury site and a prognosis to predict when and if the horse might return to training. The veterinarian chooses from a set of alternative plans to gain recovery based on restricting the horse to stall rest, turning him out, or following a prescribed limited exercise program. The program is determined by the site of the injury and the clinician's knowledge of and experience in successfully treating that injury site. If the injury isn't properly or fully diagnosed, facets of the recovery plan--including medications and adjunctive hoofcare--might not be effective, time may be lost and the horse's chances at returning to his former level of performance are jeopardized. The hoof capsule is the horse’s best friend: it’s a protective covering, a shield against rocks and bumps, and a tractable aid to locomotion. If the horse had to gallop on a soft digit, could he gallop at all? The tough shell of his hoof wall is the horse’s best friend--until something goes wrong inside the foot. Then it takes sophisticated imaging equipment to see what’s going on inside that wall, and beneath that sole and frog. When we want to know what’s going on in there, it’s time for technology to take over. A recent study at the Marion duPont Scott Equine Medical Center in Leesburg, Virginia delved into some details of cases of chronic, unresolved foot lameness. Might these cases have something in common, besides that the horses were all lame in one front foot? The researchers wondered, and compared the horses’ records. While many studies have logged in data about test-case horses with specific acute injuries revealed only by MRI--deep digital flexor tendon lesions in sport horses are prime examples--this study looked at a larger population of horses that had been lame for some time (from three months to five years) and which had not received the benefit of an MRI before they were referred to the hospital for further testing. Each of the horses had responded favorably to a palmar digital nerve block in the lame foot, so the clinician was confident that the horse’s pain source had been isolated. MRI was performed if clinical and radiological findings did not provide a definitive diagnosis and if the owners elected further examination. Another thing the cases had in common is that, after referral, each of the horses had been scanned using the same MRI technology: the Hallmarq Veterinary Imaging “standing MRI” system installed at the hospital in Leesburg in 2007. Horses with chronic forefoot lameness were selected for the study. A Hallmarq standing MRI scan was employed to look for damage to soft tissue structures in the coffin joint and navicular zone. The veterinarians selected 79 horses that fulfilled the selection criteria for the study and began to compare their records. The biggest thing that the horses had in common was that the MRI scans revealed that almost all of them--74 out of 79--were actually showing more than one structure in the foot with an alteration. In most (52) of the 74 horses with more than one change, the multiple abnormalities were not of equal severity. What types of injuries did the MRI scans reveal on these chronically lame horses? • 39 percent of the horses were suffering from collateral ligament desmopathy of the coffin joint. Who were these horses? Breeds included Thoroughbreds (24), Warmbloods (36), Quarter Horses (9) and others (10). Occupations comprised jumping (37), eventing (12), dressage (17) and pleasure riding (13). The mean age was nine years old, but ranged from four to 24. What’s the take-home message from this research? If you’ve been reading the Hoof Blog for a while, you already know a good bit about Hallmarq’s standing MRI technology, which is now available in dozens of veterinary clinics around the world. MRI was the next level of diagnostic imaging for horses whose injuries were not revealed by other systems or, in the case of navicular changes visible on radiographs, would benefit from a more detailed evaluation. Not so long ago, we would have labeled these horses as simply having a chronic foot pain condition or, more likely “navicular disease”. Farriers would try different shoeing techniques or trims, hoping to hit on a magic combination of support and comfort. Pain medication, coffin joint injection and perhaps even neurectomy would be on the menu. Some horses recovered sooner, some horses recovered later, some horses stayed lame. Having access to MRI is much like calling in Sherlock Holmes when the police have failed to solve the crime. MRI results can often be surprising, as we see here, when the scan is expected to yield a given result and does, but also reveals more information than anticipated. The deep digital flexor tendon (arrows) is a common site of injury in sport horses. While some injuries or abnormalities of the navicular bone can be seen on radiographs, lesions to the tendon require imaging that reveals the soft tissues of the inner foot. The identification of multiple injury sites in the foot is critical if the lameness is to respond and recover. In 2003, papers by Dyson and Murray in Great Britain and by Schneider and Sampson in the United States used MRI to document that equine foot pain often can be traced to multiple structures. This important new consciousness has been a critical factor in the growing appreciation of using MRI as a diagnostic tool, and the Virginia study certainly confirmed those findings in a large number of horses. 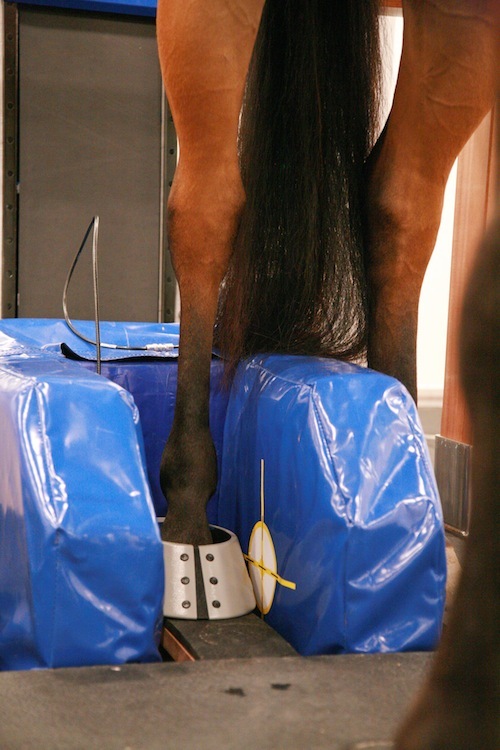 A benefit of the standing MRI system for evaluating horse foot lameness is that the horse is not required to undergo anesthesia. The horse stands on all four feet throughout the procedure, which may be performed as an “out-patient” type of appointment at a vet clinic that is equipped with the Hallmarq system. This research was part of a series of MRI-related studies on foot lameness conducted by Santiago Daniel Gutierrez-Nibeyro, DVM, MS, DACVS as a component of his Masters in Science degree. The entire set of research papers is a tremendous asset to anyone wishing to understand how MRI imaging fits into the bigger picture of equine foot lameness diagnosis and treatment. Outcomes of Medical Treatment for Pathologies of the Equine Foot Diagnosed with Magnetic Resonance Imaging by Santiago Daniel Gutierrez-Nibeyro, M.V. Disclosure of Material Connection: This blog post is sponsored by Hallmarq Veterinary Imaging. I am disclosing this in accordance with the Federal Trade Commission’s 16 CFR, Part 255: Guides Concerning the Use of Endorsements and Testimonials in Advertising.